Are you looking for paintball places in your area? You have found the perfect place. Action Packed Paintball Games is located in the Twin Cities and is an outdoor paintball park that is great for groups or individuals. There are eight fields that can be played on. This park can accommodate up to 150 people or more at a time. Groups can play any day of the week or weekend. They do need to call in order to make reservations to play. The contact number for reservations is 952-492-6776. For those individuals that don’t have a group to play in, they can play on Saturdays and Sundays. These are the days that offer walk-on play. Those that are playing can either rent equipment or bring their own. If they are bringing their own equipment, they will not be allowed to use their own paint. Paint can be purchased before playing. There are season passes available for those that love playing. The season runs from November 1st of the current year until November 1st of the next year. The season pass will cover the entry fee and make it free for the member for walk-on play. They will receive a discounted rate on paint. They will also still get to take advantage of free compressed air every time they play. 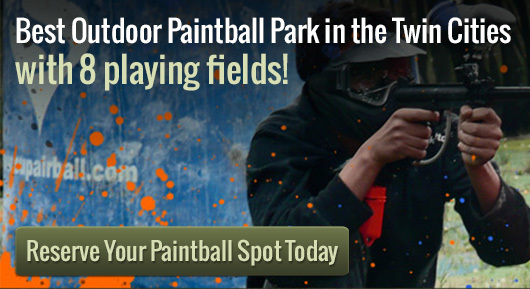 There are other paintball places available for indoor play, also. Those paintball places are Splatball in downtown Minneapolis and Air Assault Indoor Paintball in St. Paul. Splatball is open for walk-on play on Fridays and Sundays. Air Assault Indoor paintball is open for walk-on play on Saturdays. Do you have questions or would you like to reserve a spot? Give us a call at 952-492-6776.